Manchester United inflicted more misery on Fulham with an easy win at the Cottage. Two goals in the opening 23 minutes all but killed the contest, paving the way for a sixth defeat in seven matches for the relegation-threatened Whites. Paul Pogba, who netted the opener before Anthony Martial doubled the lead, made it 3-0 after 65 minutes with one of his trademark multi-step walk-ups. The opening salvos had offered some encouragement for the home side, with a counter-attack led by Andre Schurrle ending with a menacing cross to the far post, where Luciano Vietto shanked wide. Then Joe Bryan’s cross from the byline only just failed to reach the head of Aleksandar Mitrovic. But the optimism was soon punctured. United, rampant since the return to the club of Ole Gunnar Solskjaer as caretaker boss, were in front after 14 minutes. Pogba took delivery of a Martial pass behind a static-looking Fulham defence to thrash the ball inside Sergio Rico’s near post – Calum Chambers unable to close down the French World Cup winner. And on 23 minute, the fleet-footed Martial made it 2-0 – racing away from Denis Odoi from inside his own half and skipping through a lame challenge from Maxime Le Marchand before curling past Rico. A Chambers effort from outside the box proved no trouble to Davd De Gea before the break and turned out to be one of the few moments of semi-alarm for the comfortable visitors. Pogba made it three after Juan Mata had twisted into the box and bumped into Le Marchand, who had an afternoon to forget. Th struggling defender’s stray header soon after almost allowed sub Alexis Sanchez to do more damage. 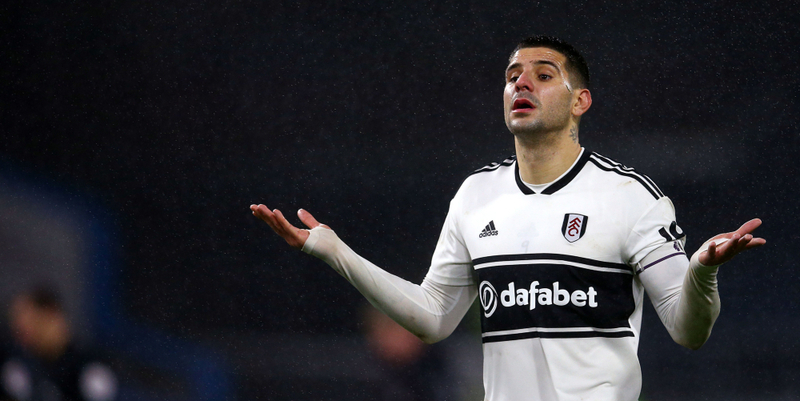 Fulham: Rico; Odoi, Le Marchand, Ream, Bryan (Sessegnon 80); Chambers, Seri; Chambers, Seri; Schurrle (Christie 53), Vietto, Babel (Cairney 77); Mitrovic. Subs not used: Fabri, Zambo Anguissa, Kebano, Ayite.